That side of our personality is not, however, easy to ignore. Continuing with the car analogy, if you’ve ever driven with a 3-year-old you know they’re only quiet when they fall asleep for a little while. Even when they’re happy and chatting they can be distracting. When they’re upset, it’s almost impossible to focus on anything else. When the 3-year-old mental process in the backseat of your mind is throwing a temper tantrum, it’s hard to see the inferior function as anything useful. Often, I feel more like I’m “dealing with” my inferior Extroverted Sensing than learning from it or profiting by it. But as annoying at it can seem at times, it’s still one of the four mental processes that you have most access too. Even if it’s only 3-years-old, it’s still better developed then one of the four mental processes that’s completely outside your function stack. 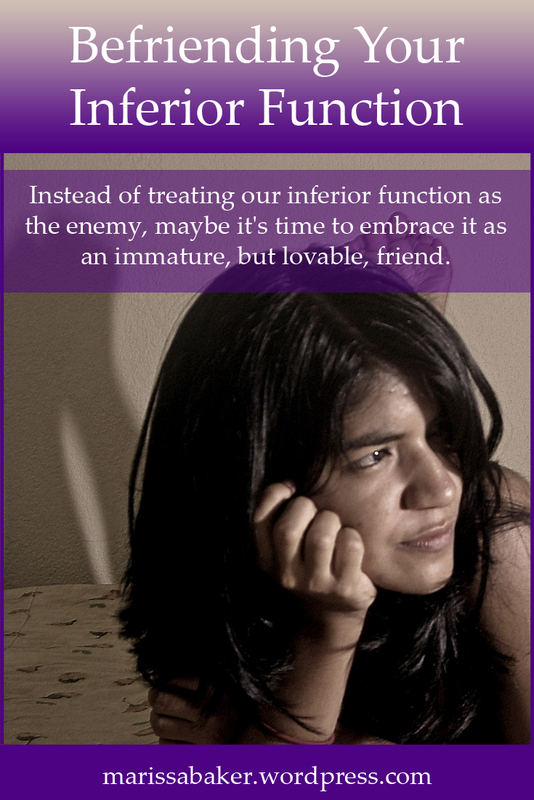 Instead of treating it as the enemy, maybe it’s time to embrace it as an immature, but lovable, friend. You can also look up your inferior function by Googling “Extroverted Thinking” or “Introverted Sensing” or whichever function is lowest on your type’s function stack. Most articles you find that way will be talking about a healthy, mature form of that function as seen in types that use it as their primary or secondary mental process. Remember when reading these articles that it will show up differently for your type, since it’s not well developed. You might be frustrated that your inferior function can’t work as effectively in your mind as it does for people who use that mental process more readily. I’m an INFJ, which means Extroverted Sensing is my inferior function. People who use Extroverted Sensing effectively have “real-time kinetic” skills and respond quickly to things happening in the outer world. I’m so oblivious to the outer world that I run into doors on an almost daily basis. Even keeping track of my own hands and feet can be hard — once I wondered why my ankle hurt, and looked down to discover blood dripping from a cut I couldn’t remember happening. Things like that can be really frustrating. But if we’re trying to befriend and cultivate our less-developed mental process, it’s better to start out accepting it how it is than hating how our minds naturally work. In fact, many of us could already be using our inferior function and not realizing it. An ENFJ who works with computers is using their inferior Thinking side at work. An ISTP with who cultivates close friendships in their local church is tapping into their inferior Feeling side. You might start out exploring your inferior function through hobbies. When you’re reading about your inferior function, take note of what sort of skills and hobbies are usually enjoyed by types who use that function effectively . In my case, I’ve always enjoyed gardening and cooking, which are two endeavors that use Sensing skills. I’ve also started consciously cultivating awareness of the world around me through my yoga practice. I’ve found that just knowing about your inferior function is a personal growth step. You finally have an explanation for why you react to stress the way you do, and why sometimes you have a “Was That Really Me? “* moment (which is the title of an excellent book by Naomi Quenk on inferior functions). Once you start understanding why your mind works the way it does, you can start learning how to use your natural stills more effectively. Type theorists often call becoming comfortable with your 3-year-old mental process ‘incorporating your inferior function.” This should make you a more well-rounded, balanced individual who’s comfortable in their own skin and it better able to exercise forgiveness/acceptance toward self (and others) in areas where we’re naturally not as strong. As an added bonus, you’ll also start to strengthen that under-used part of your mind, making it less likely to trip-you up (at least in theory). Your turn: What sort of hobbies do you enjoy, or skills do you have, that are not typical of your personality type? do you consciously use your inferior function? 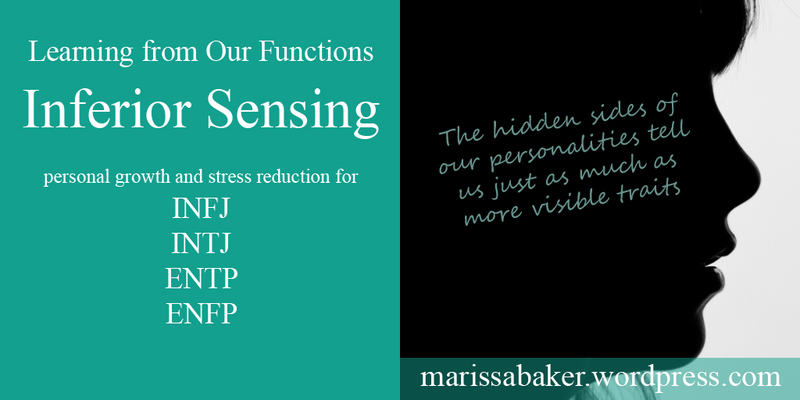 When we’re talking about someone’s personality type in the Myers-Briggs system, we usually discuss their primary and secondary functions (also called mental processes). An INFJ, for example, leads with a process called Introverted Intuition (a perceiving/learning function), which is supported with Extroverted Feeling (a judging/decision making function). An ENTP, on the other hand, leads with Extroverted Intuition, supported by Introverted Thinking. Using Personality Hacker’s car model,* we can compare our primary function to an adult driving a car, and the secondary function to a second adult navigating in the passenger seat. Each type also has a tertiary function (the opposite of their secondary function), and an inferior function (the opposite of their primary function). These are less well developed. In the car model, our tertiary function is like a 10-year-old sitting behind the co-pilot, and the inferior function is like a 3-year-old sitting behind the driver. The two processes you use most are more visible, and they define your personality as others typically see it, but our less developed functions play a significant role as well. Today, we’ll be looking at types which use Sensing as an inferior function. ENTPs, ENFPs, INFJs, and INTJs usually rely on their dominant Intuition and then, to a lesser extent, their Thinking and Feeling functions. 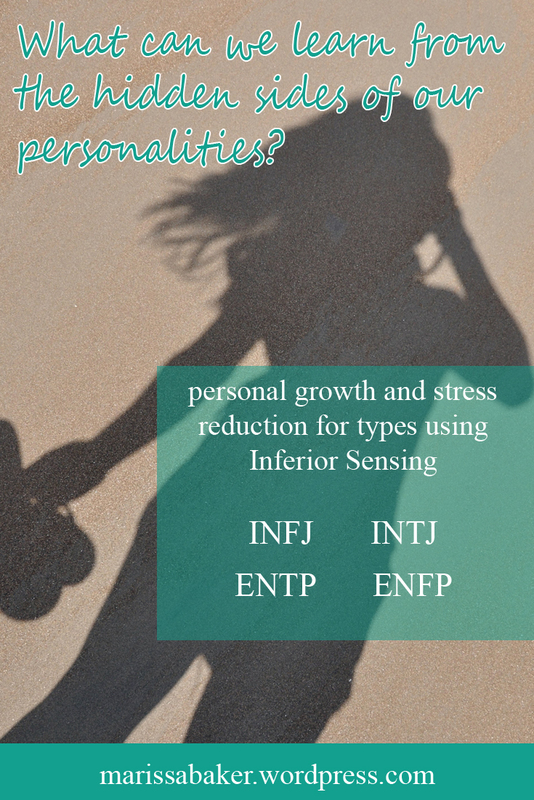 Inferior Sensing can, however, still show up in their everyday lives, often through hobbies and interests that don’t seem to quite fit with the more visible aspects of their personalities. Often, dominant Intuitive types will excel in one or more particular area that requires using Sensing to notice details and interact with physical things in the world around you. This could be something like doing your own accounting, specializing in a certain kind of cooking, or maintaining a nice garden. It could also be a more active hobby like horseback riding, hiking, or team sports for the extroverts. Listening to music, attending concerts, and reading escapist literature is also popular. INFJs and INTJs also lead with an intuitive function. They primarily use Introverted Intuition, so that makes Extroverted Sensing their stress function. Here are the traits Quenk associates with inferior Extroverted Sensing (and their counterparts in Se-dominant types like ESTPs and ESFPs). As you can see, there are similarities in how a dominant Sensing type and an inferior Sensing type use their sensing functions. In the case of ENFPs, ENTPs, INFJs, and INTJs however, sensing is poorly developed and rarely used effectively. Though Sensing plays a role in the everyday lives of ENFPs, ENTPS, INTJs, and INFJs, it shows up most often when these types are stressed. The sort of stressors we usually think about (running out of time, feeling overwhelmed, grief, etc.) can all trigger an inferior function episode. Some extra things that intuitive types are sensitive to include someone pointing out a sensing/factual mistake, physical exhaustion, and having to keep track of lots of details at once. Both introverted and extroverted intuitive types have have trouble with focusing on their bodies too much when stressed. Dominant Sensing types are usually comfortable in their own skins and enjoy sensory experiences like eating nice food or drinking a good wine. But stressed intuitives might develop hypochondria and blow any sort of medical concern out of proportion, or over-indulge by eating and drinking too much. They can also binge on other sensory pleasures, like obsessively gaming or watching too much TV to escape the outer world (Quenk p.197-201, 245-521). Stressed intuitives often retreat from the world. It seems particularly hostile when we’re stressed, and all the incoming sensory data is simply too much to handle. The extroverted types will isolate themselves and fall into depression, while introverts tend to get angry, suspicious and hostile (I also know ENFPs who get angry when stressed, and INTJs who get depressed. It’s not just an Introvert/Extrovert thing). Not everyone gets out of their stress reaction using the same techniques. For INFJs and INTJs, as for many introverts, “space and a low-pressure environment” are key to returning to equilibrium. Quenk also notes that “INTJs and INFJs agree that the worst thing others can do when they are in this state is to give them advice or try to fix the problem” (p. 207). When stressed, we’re not processing things logically and if you try to convince us that how we feel isn’t valid, we don’t take it well. Eventually some Introverted Intuitives want someone to talk with, especially INFJs, but not at first. Extroverted Intuitives also need significant amounts of alone time. They really need people to “back off and avoid patronizing them.” They’re more likely than introverts to talk it out with other people, but, like the INFJs and INTJs, ENTPs and ENFPs just need someone to listen, not try to fix things. ENFPS in particular eventually want someone to validate their feelings and reassure them (Quenk p. 258). Getting out and taking a walk or exercising is often helpful for all the types using inferior Sensing. Introverted types prefer to do this alone, while extroverts might want more company. Quenk says that extroverted types are also more likely use getting adequate sleep, eating good food, and doing something relaxing to climb out of a grip experience (p. 258), but I can say from experience that some INFJs also find that useful. Integration of the inferior function into everyday life generally happens in mid-life. However, Intuitive types can start learning to use their Sensing function any time. Isabel Meyer suggested that every type exercise all four of their functions when making a decision. Your dominant Intuition is able to gather and generate possibilities, which is great for creative problem solving. When we add Sensing, instead of ignoring it, we can start to use more of an impartial, realistic approach to problem solving. It’s useful for finding out exactly what the problem is so we can use our intuition to solve it (Meyers, Gifts Differing *, 197).